id Software has a lot on its plate. The developer has its fingers in Wolfenstein, Quake Live, Doom 4 and Rage, maybe even some Wii development. So it's no surprise that Rage won't make 2009. Todd Hollenshead, the ponytailed co-owner and CEO of id Software, drove that point home in the most recent episode of GameTrailers TV. He pegs the first-person shooter action adventure for a 2010 release at the earliest on the PC, Mac, PlayStation 3 and Xbox 360. Not a big surprise, despite the fact that Rage was announced in the Summer of 2007. 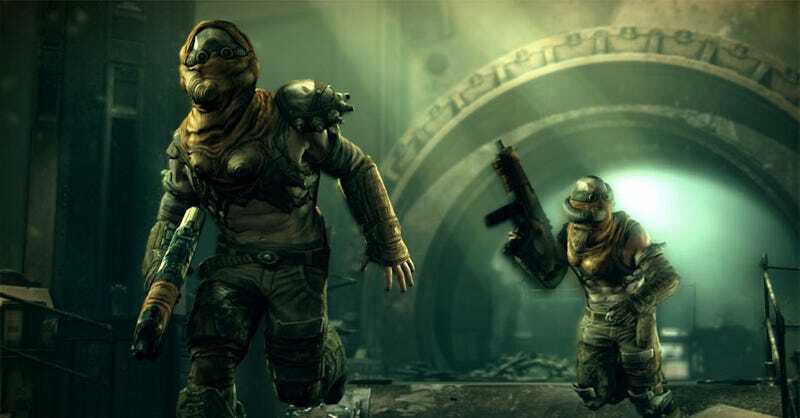 He'd given the game a very wide release window at last year's Quakecon, simply saying that the shooter would arrive earlier than 2011. id's also delivering new technology alongside the game, the bluntly named id Tech 5. Hollenshead says that development on Rage—which is not a racing game, not quite an open world shooter—is "going well" with gameplay already having been tightened up. The id CEO also drops extremely brief details on Doom 4, which may simply be called Doom, which Hollenshead says will feature demons, shooting and a guy. Tell us more, Todd! Seriously, can you tell us a little bit more?